Volkswagen Touareg Review 2019 | What Car? Since 2003, the Volkswagen Touareg has offered buyers of luxury SUVs a less blingy alternative to premium-badged rivals. Or rather it did until last year. Still, look past the in-your-face chrome grille and there’s a very sensible vehicle underneath. It’s bigger yet lighter than its predecessor, it’s packed to the panoramic sunroof with tech and it can tow up to 3500kg. 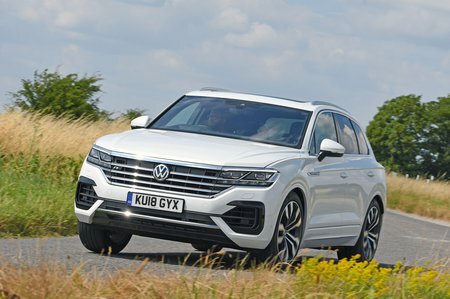 What's more, the Touareg shares a platform with the Audi Q7, Porsche Cayenne, Bentley Bentayga and even the Lamborghini Urus – all cracking cars. Although it doesn’t have the same level of firepower as its pricier siblings, you still get a 3.0-litre turbocharged V6 diesel, and there’s a V6 petrol on the way. So if you’re in the market for a luxurious SUV, stick with this comprehensive review for our verdict. And if you want to get yourself a good deal on a Touareg, don’t forget to visit our New Car Buying site.